Water is our planet’s most precious resource. It is required by every living thing, yet a huge proportion of the world’s population struggles to access clean water daily. Agriculture, aquaculture, industry, and energy all depend on it - yet its provision and safety engender widespread conflict; battles likely to intensify as threats to freshwater abundance and quality, such as climate change, urbanization, new forms of pollution, and the privatization of control, continue to grow. But must the cost of potable water become prohibitively expensive for the poor - especially when supplies are privatized? Do technological advances only expand supply or can they carry hidden risks for minority groups? And who bears responsibility for managing the adverse impacts of dams funded by global aid organizations when their burdens fall on some, while their benefits accrue to others? In answering these and other pressing questions, the book shows how control of freshwater operates at different levels, from individual watersheds near cities to large river basins whose water - when diverted - is contested by entire countries. Drawing on a rich range of examples from across the world, it explores the complexity of future challenges, concluding that nations must work together to embrace everyone's water needs while also establishing fair, consistent criteria to promote available supply with less pollution. David Lewis Feldman is professor and chair of planning, policy, and design at the University of California, Irvine. "Feldman's useful and clear overview of the modern world of water makes a very strong case overall for the involvement of scientists and local people in planning." 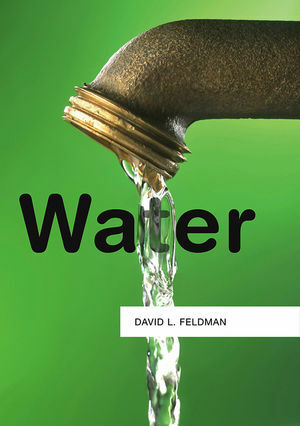 "David Feldman has thoughtfully tackled one of the most important global issues of our time - water sustainability - by broadly integrating useful data and examples, clear and accessible writing, and systematic analysis of the problem's human dimensions, including environmental justice, privatization, conflict resolution, stewardship, and conservation." "Feldman eschews the simplistic characterization of water scarcity as an engineering problem, instead framing the challenge in the language of sustainability, and implicating issues of inequity, poverty, and geopolitics shaped by growing populations, climate change, environmental destruction, and food and energy shortages. It’s ambitious and skillfully executed - and immensely entertaining." "David Feldman demonstrates an impressive depth and breadth of knowledge of the functional, geopolitical and policy dimensions involved in dealing with water as a precious, multi-faceted natural resource in its contemporary context of a planet increasingly perceived under pressure."